Have you ever had a moment where you clearly could see how every detail of a project could easily fall into place? Ever had the experience of thinking of someone, and then they called you? Did you ever just KNOW something was going to happen and then it did? Has it happened that the most amazing idea popped into your head, seemingly out of nowhere? The sixth chakra is sometimes called the Third-Eye because it’s about seeing. This center is about intuition: your ability to visualize, to imagine, to be clairvoyant (meaning clear seeing), and to hold a greater vision for your life. A balanced sixth chakra offers the ability to call forth ideas and make them manifest. Chant to open this chakra: OM. Try saying it three times, really allowing the word to be pronounced as AUM slowly. About the symbol for this chakra: Two lotus petals blossoming reflect the two worlds of reality: physical and spiritual. Inside the circle is a triangle that points downward symbolizing creative energy. The Sanskrit symbol for the chakra is OM–which is the universal hum. 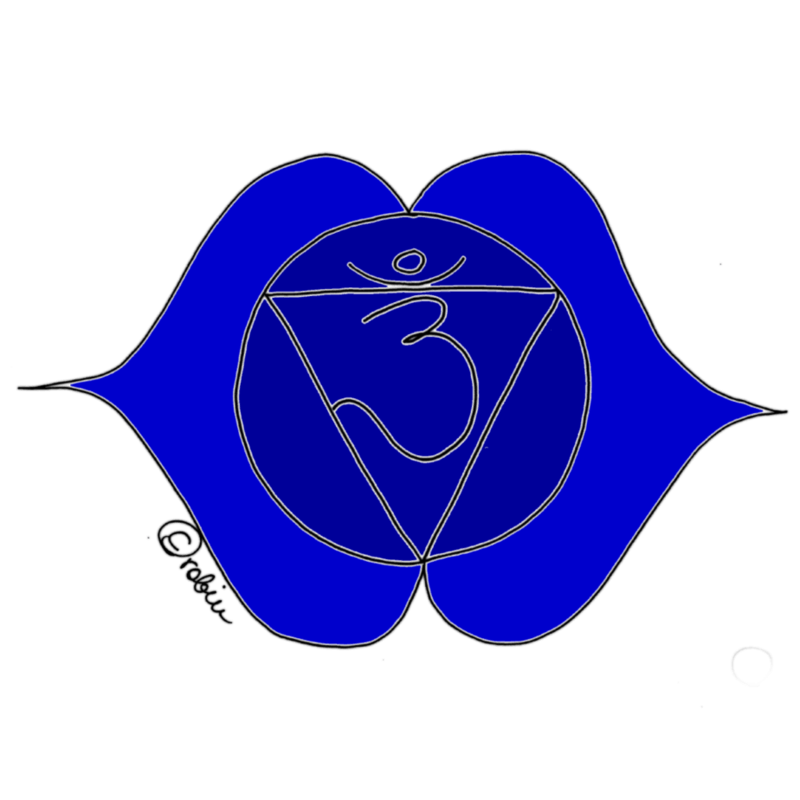 The color of this chakra is deep indigo blue. The word Ajna means: knowledge bestowing lotus. Daily drama: We can be so filled with the little mental dramas of every day life that we crowd out the subtle refined messages of the third eye. If you’re truly interested in developing a greater vision for your life, you’ve got to learn to let the little stuff be little! Thoughts about past and future: Start to notice how often your are drifting into the old stories of the past, or fast forwarding on to your hopes for the future. While you do this, you are not here in the present moment. This time NOW is the only time when we can create. Strong mental focus: This chakra is about balance between the physical and spiritual world. If you’re a mentally brilliant type who usually has a head in the books, consider a little break time to sense the more subtle energies. Strong woo-woo focus: Again, it’s about balance. Those of you with a strong energy focus who feel more comfortably tuned to the subtle energies also need to practice balance to have a healthy functioning sixth chakra. All that meditating in those upper realms can truly leave you floating around like a space cadet! Misinterpretations: Do not be fooled by the insecurities of the third chakra that sometimes give you the impression that you are “picking up negative vibes” from other people. Everyone has self-confidence drama that unfolds in the third chakra such as insecurity, jealousy, power plays, fear, and greed. It’s very easy to assume those feelings are being directed at you by someone else. Before you believe the ego’s distorted reality and act upon it as if it’s sixth chakra guidance, use your discernment! Stay curious about the possibility that you are perceiving reality through a distorted lens. Get out into the sunshine: Light gets translated into little hormone ‘messages’ throughout your body by the pineal gland. These signals are more robust when you have higher exposure to light. So get your bod out into the sunlight every day. If you happen to live in dark regions, take a good vitamin D3 supplement. Essential oils: Frankincense, patchouli, myrrh, sandalwood, sage, and lemon are all good for the sixth chakra. You can put a few drops into your hands and inhale the essences. You can also place a very small drop onto your third eye directly. Letting go of the daily dramas, and staying grounded in the present moment are an important part of developing this chakra.